We have been working on re-designing one of the LANs in our offices. We have 2 buildings, and all the access switches from these buildings are connected into the 4503s (Switch 1,2,3 and 4) as show in the figure. 1) All the access switches in building A connect to Switch 1 and 2, and all the access switches in building B connect to Switch 3 and 4. 2) Switch 3 is connected to Switch 1 through Gig port. 3) Link between Switch 1 and Router 1 is an access port, and there is a default route configured to reach the router. Same goes between switch 2 and Router 2. 4) Switch 3 and 4 are just layer 2 devices, and all access switch uplinks terminate on it. Switch 1/2 have SVIs (VLANs) defined and it is the root bridge for all the VLANs in that office. 5) Both the MPLS WAN Links are 6M each. Our proposed design is in the second figure. We are planning to have Ether channel between switch 1-2, 3-1 and 4-2 - so that there is ample bandwidth available for the combined traffic. 1) Will the Ether channel be required on the cross links between these switches? Will the Ether channel be also required between switch 3 and 4? Will STP be a bottleneck in blocking ports? 2) Can Ether channel be formed between TenGig and Gig interfaces? We read that it can be formed only between ports of same speeds. please confirm. 3) Ideally, shouldn't there be layer 3 links (/30) between all the 4503 switches, and these should be advertised via Eigrp onto the router. 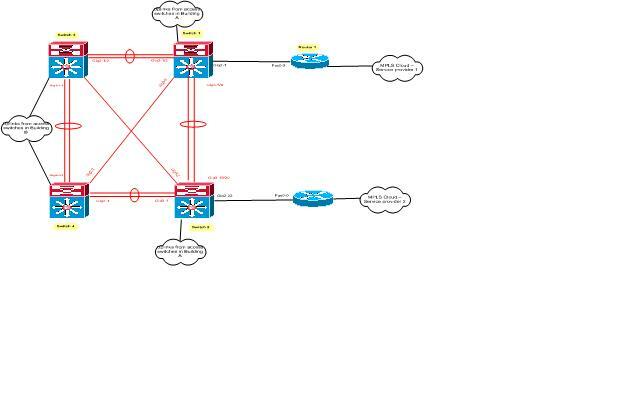 We can then redistribute the Eigrp routes into BGP (which is running with MPLS service provider). Wouldn't this give more redundancy and less downtime? 4) The links from Switch 1 and 2 are terminating on a Fast Ethernet port on the Routers. Will this be a traffic bottleneck again? Keeping in mind that the total traffic going out cannot exceed 6M ( as it is the WAN capacity), should this be considered at all? You might not ether-channel on cross links. You have optimum redundancy in this design. In your recommended design you already have ether-channel between switch 3 and 4. If you can have the ether-channel between switch 3 and 4, it will be good. Running STP in the backbone design might not be a good idea. It can result in a sub-optimal forwarding topology. Unless you manually configure their primary root bridge and secondary root bridge over this network, STP will be a challenge. If I were you, I would use a routing protocol in the backbone for this design. No you cannot have the different speed links in an ether channel. 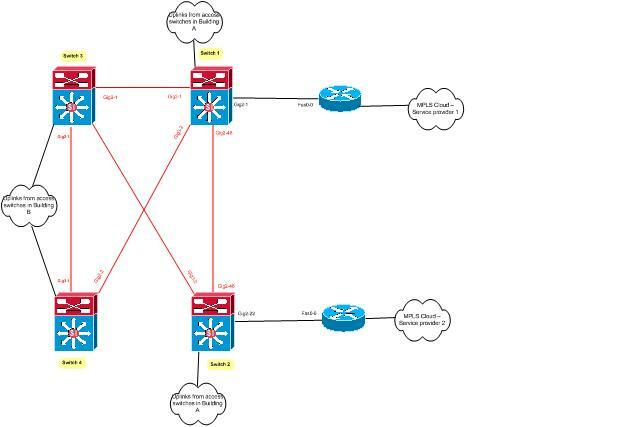 Yes, I would ideally run either EIGRP or OSPF in the backbone for this design. I will get dynamic multi-pathing, fast convergence, loop-free topology with fast link fail-overs and automatic traffic forwarding in case of a link failure. You have to measure the overall traffic hitting the routers. it might be a challenge if you get more traffic on the router than its forwarding capability or the over all WAN link capacity. This is where a proper QOS policies will come into the picture. If you are running multiple critical application over the network, you might have to consider the QOS policies with various forwarding priorities. Regarding "2) Can Ether channel be formed between TenGig and Gig interfaces?" If your intent is to have a failover from a primary TenGig connection down to a Gig connection, consider the Flex Links capability on your 4503s. "With Flex Links configured, one link acts as the primary interface and forwards traffic, while the other interface is in standby mode, ready to begin forwarding traffic if the primary link shuts down." "A backup link does not have to be the same type (Fast Ethernet or Gigabit Ethernet, for instance) as the active link."